It is possible to access Wikipedia on mobile devices such as tablets and smartphones through several different methods. Official Mobile English Wikipedia. Users of supported mobile devices are automatically redirected to the official mobile version of Wikipedia. Supported: iOS, Android, WebOS, Opera Mini, NetFront (Amazon Kindle, PlayStation Portable, PlayStation 3), Nintendo Switch, etc. Tablets are served a slightly modified version of the mobile site, which makes use of the larger screen size to e.g. show a table of content and display all article sections open by default. This mobile version is available for all languages of Wikipedia. It is actively developed, supported and translated. It supports editing and image uploading; visit any article and you'll see a pencil icon on every section. Anyone, including those who are not logged in, can use the mobile editor. You can also check your watchlist on mobile, add/remove articles from it, and more. If you don't want to use the mobile version, you can find options at the bottom of every page to switch to the desktop version. The mobile version is based on the MobileFrontend extension of the MediaWiki software, and maintained by the Wikimedia Foundation's Reading Web team. Wikipedia mobile on Opera Mini 5. Older featurephones' native browsers commonly have limited functionality and are outdated. If your phone is Java ME-capable, you might consider installing Opera Mini, a Java ME-based Internet browser for mobile phones. Some phones have Opera Mini built-in, and may only require setting the browser up for use. Opera Mini works by sending a request to Opera's servers, which return a compressed and stripped-down page to the phone. Depending on version, Opera Mini is often more functional and up-to-date than the native browser supplied with the phone. Opera Mini has a built-in Wikipedia search facility. Opera Mini website — Various versions are on offer to match the capabilities of a particular phone. For many users stuck with Android 2.3 (and maybe older) on their phones and tablets, the stock Android Browser is the default browser. The browser released with Android 2.3.6 is from September 2011, and is based on WebKit 533.1. This version remains common, even if some device manufacturers may have used a newer browser engine for their distribution of Android 2.3.x. In early 2015, Wikipedia mobile and its sister sites introduced a redesigned search box at the top of each Wikipedia page, along with search suggestions. The new search box was rendered properly in modern browsers, but for many months, the redesign failed the stock browser on Android 2.3 and earlier, as the search box stayed obscured by another box until about mid-June. After a design update, the search box is again visible and accessible with the older Android Browser, even if search suggestions don't work. Through that time, a workaround has been to use the Wikipedia Android app, or an alternative and more modern browser, such as Firefox for Android, which is still developed and released for Android 2.3. While search suggestions don't work in the stock Android 2.3 browser, they do in the Wikipedia app and in Firefox. On low-spec mobile phones, Firefox for Android can be less responsive than the well-optimized stock browser or the native Wikipedia app: for example, editing Wiki page code may be slow on Firefox, whereas some complex pages are rendered faster by Firefox than the stock Android Browser. Technical resources: mailing list and bug lists linked above, apps development team page. "WP:IPHONE" redirects here. For the WikiProject taskforce, see Wikipedia:WikiProject Apple Inc./iOS task force. The official iOS application from the Wikimedia Foundation is called "Wikipedia Mobile". It is free, and lets you read and edit articles. It shows links to other language versions and article history, but not watchlist or talk pages. The mobile app version of the English Wikipedia's main page. The official Android application from the Wikimedia Foundation is called "Wikipedia". It is free, and lets you read and edit articles. It has no article watch feature. The official Windows 8 application from the Wikimedia Foundation can be downloaded from Windows Store. If a browser is installed for general use, it can be used to access the general Wikipedia site, also for editing, depending on limitations of the browser. One may want to adapt the user style and preferences to optimize them for the mobile device. For example, navigation popups may or may not be convenient on the mobile device. The official mobile version of Wikipedia is located at http://en.m.wikipedia.org. Over the years, many users and developers had created their own websites for reading Wikipedia on a variety of mobile devices; most of them are now defunct (as of November 2013), with Wapedia having remained until 4 November 2013 as one of the last non-Wikipedia holdouts to serve WAP-formatted textual Wikipedia content for mobile devices. A computer-generated audio (speech synthesis) version of all Wikipedia articles is provided by the Pediaphon service. It is usable on- and off-line with common MP3 players, PDAs, cell phones (WAP) and with every phone via voice call. Pediaphon can be used as a location-based service. WikiPock is a mobile application that provides offline access to all Wikipedia articles in 22 languages for Windows Mobile, BlackBerry, Android and Symbian OS mobile phones. All the articles are stored in the mobile phone's memory. 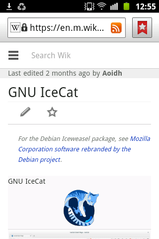 Evopedia is a discontinued application that provides offline access to all Wikipedia articles in different languages for Android (Beta), Firefox OS, Linux (Arch, Ubuntu), Maemo, Openmoko, QtMoko and Windows. Math formulas, on-line loading of images, Wiktionary dumps and a geographical article search are supported. Amazon Kindles have access to Wikipedia content on the "experimental browser" included in Kindle software. All content is shown in black-and-white (all colored images and graphs are converted). The Wiki-as-Ebook project provides massive encyclopaedias for E-Book-readers created from a large set of Wikipedia articles (commercial; 2013). Colored images are converted to grayscale. Wikimedia Commons has media related to Wikipedia on PDAs and mobile phones.